I know I’m running out of time but I’m still not sure if I’m hosting a holiday party near Christmas. I really need to make the decision fast, but I’ve been invited to two parties not to mention going to my in-laws on Christmas Eve, so I may just have to take holiday appetizers to my m-i-l’s house… like Rich’s SeaPak Spring Rolls. 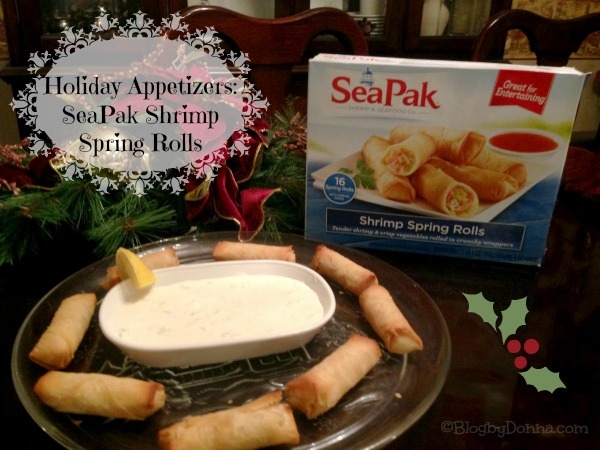 I stopped by Walmart on Sunday where they had a live SeaPak Shrimp Spring Rolls demo going on and after one bite, I knew these were the perfect holiday appetizer. I grabbed a box to take home for my family to taste test, though. 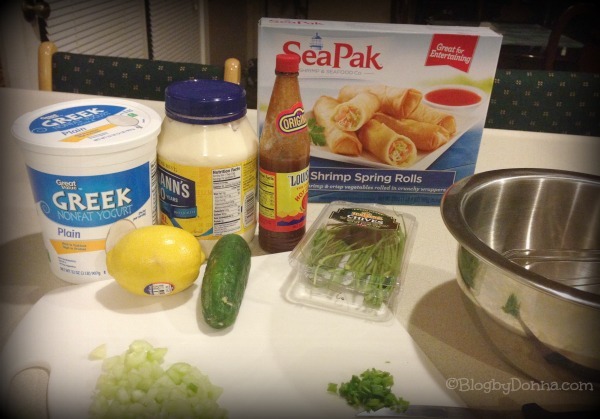 If it passes my son’s approval (he is picky), then I know the spring rolls will make a great party snack. 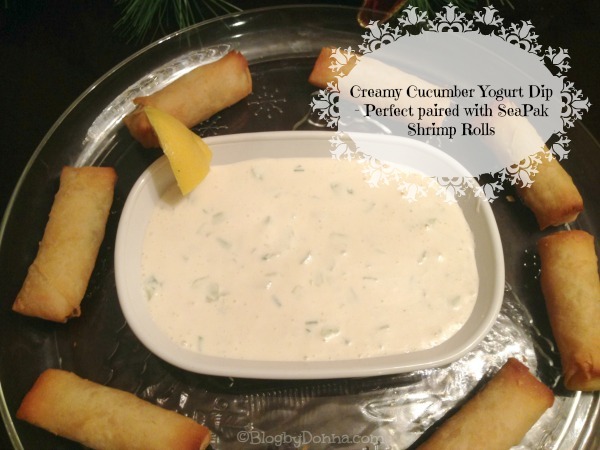 They come with a dipping sauce, but I wanted to make a a delicious Cucumber Yogurt Dip I made. I got two thumbs up from both my husband and son. A thumbs up is all I could get out of them since they had their mouths full and wouldn’t stop eating long enough to talk. Okay, I don’t have room to talk here, because I was devouring them up, too. I love shrimp, and I don’t think you’d have to love shrimp to enjoy these party snacks. They’re THAT good! We love shrimp and spring rolls, so SeaPak’s shrimp spring rolls are a perfect marriage. Rich’s SeaPak Shrimp Spring Rolls are crispy on the outside and the perfect blend of seafood and Asian flavors. Honest to goodness, if I had not already known they were frozen, I would not have believed it. The Ladies Home Journal agrees with me. They voted them the 15 best frozen appetizers to serve at a party. I’m thrilled that I don’t have to make from scratch a holiday appetizer this Christmas, but everyone will think I did. Shhhh… it will be our little secret. Be sure to follow SeaPak on Twitter and SeaPak on Pinterest to get news, recipes, coupons, and more. Have you tried SeaPak Shrimp Spring Rolls, yet? What’s your favorite party snacks? I buy SeaPak all the time; I like their fried shrimp. We like spring rolls here at our house. I did not know that SeaPak made them. I surely will look for them in the stores now. Thanks for the recipes for dips too. Yum! Those Spring Rolls look so delicious! I am having a party this weekend, I need to go grab some! I can see that those would be grabbed like crazy at a party, and also having the dip for them is a fantastic idea. Mmm, that dip sounds amazing and I’ll definitely have to pick up some of these spring rolls on my next trip to the grocery store. I’ve had spring rolls, but never with shrimp. These seem like a wonderful appetizer for Christmas parties. Sounds tasty!! I like your dip you made, might have to try that out!! Those look delicious. Never had them before. And I really will have to try to make that dip. Yum! Yum! I love spring rolls, and shrimp ones are twice as nice! We love SeaPak and I havent seen these yet. They would be great for the Holidays! Our New Year’s Eve lineup always includes a wide variety of finger foods. Since we all love seafood, these would make a wonderful addition to our party! Mmmmmm — I haven’t had spring rolls in FOREVER and these look amazing! I’ve never had these , but I make something similar called Lumpia. It’s pretty much an egg roll with meat. This looks so tasty! I want to try it! That dip looks so good! I’ve seen these recently and was so tempted to try them! I’m going to grab a box next time I’m at the grocery store. They’d make a nice appetizer for a Christmas Eve party I’m attending! 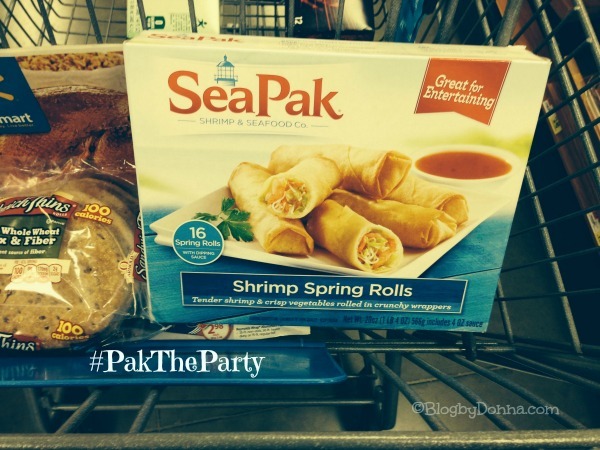 I didn’t know that Seapack make spring rolls! I love their shrimp! These do look like a great party appetizer! Oh my after I am off from my Omni diet I am buying these! Ok .. I’m officially hungry now and will be buying these today for Sunday apps before dinner! I might have to buy another box just for me! This sounds really good. I have to run to the grocery store this afternoon and have this on my shopping list now. Those would definitely be a hit at our holiday dinners. We eat appetizers more than ever during December. I will have to check these out, they look really good. Yummy, those look delicious! I may just have to buy some and try them myself! YUM! These look so yummy and your dip looks awesome! I usually buy veggie spring rolls, maybe I’ll try these next time. These spring rolls sound yummy! And the cucumber dip goes great with shrimp. Thank you for the awesome dip recipe! These look great I will have to look for them in the store – love shrimp! I’ve never had the spring rolls but I do love their breaded shrimp. The Spring Rolls would be great for holiday parties – more food, less work. I have never tried SeaPak Spring Rolls before, but I will now! Thanks for the Post, Pictures and the Recipe, sounds wonderful! I love spring rolls. Will try your dip recipe to go with it. Thanks! This is just the thing we need for a family game night appetizer! I will try the recipe too, but might lay low on the hot sauce. I love creamy dips with yogur! Oh I love SeaPak…I must try the cucumber dip. Thanks for the review. I have not had the chance to try the shrimp spring rolls! They look pretty good and the dip looks rather easy to make! I love these spring rolls but we have to hide them from my dad or he will eat them out. I love shrimp and spring rolls – great combination! My husband LOVES shrimp spring rolls, so this is something I will definitely look for. The dip sounds amazing too! My family loves SeaPak! Their popcorn shrimps are my kids’ favorite! Oh YUM, that looks delish especially with the dip! Can I come to your party? LOL! 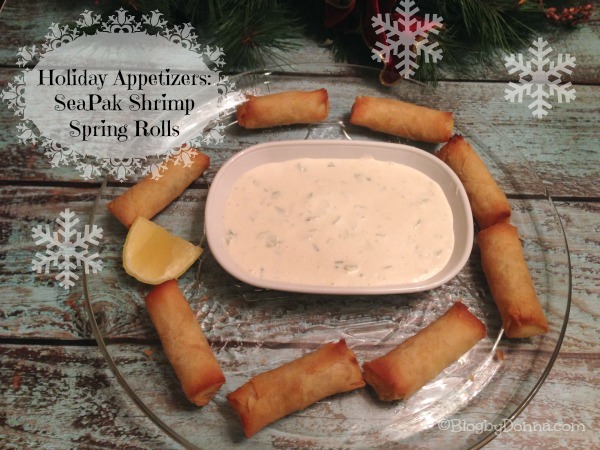 I love SeaPak shrimp Poppers, but I’ve not tried the spring rolls! I love SeaPak Shrimp Spring rolls and eat them all the time. Loving this low calorie recipe. Thanks for sharing. Those spring rolls look delicious! I need to pick some up! Sounds delicious, I love Spring rolls as an appetizer. I have never had a spring roll. Maybe it’s time for me to give them a try. They look good. I don’t eat seafood but my daughter loves it. I bet she’d like these. These look good, and I like when it’s easy to pop them in the oven! I’ve never had spring rolls but I’d be willing to try them! That sounds like a fun app for Christmas eve! That is a perfectly acceptable appetizer for New Year’s in our home. We all have such different tastes, but I’m pretty sure these will be loved by all! I love spring rolls and the dip sounds good. I think my husband would love these. I’ll have to look for them next time I’m grocery shopping. These would definitely be perfect for a party! I know several people who would LOVE them. I love spring rolls and these look delicious. I love Seapak and love spring rolls! These look yummy and easy to make, thanks for sharing! I didn’t know they made these. I’ve never tried spring rolls but, they make good sea food. I need to check the grocery store. I don’t believe that our store carries these,… I’ll have to check. We usually buy Sea Pak’s popcorn shrimp – yum! I love spring rolls. I’ll really want to try the cucumber yogurt dip. Looks pretty simple too. Seapack has a surprisingly delicious line of seafood products! I tries their breaded Butterfly shrimp one year… and it was amazing after I deep fried them! They were very tasty and I loved them! I will have to try these out as well! Thanks for sharing! That dip sounds yummy, thank you for sharing with us.